This photo was taken on a road in India. 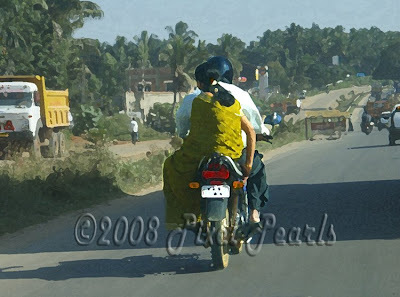 I love the striking contrast between the jewel like color of the woman's garments as she humbly rides on the back of this motorcycle and that of her dusty surroundings. India, it seems, is filled with such jewels and stark visual contrasts.